The SK7102 works with most of popular force stick sensors with tolerance up to +/- 20%. 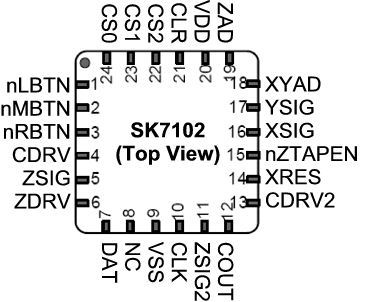 The SK7102 highly integrates oscillator, analog and digital circuit. Only several low tolerance external components are needed. Typically, consuming 0.89 mA, the SK7102 is ideal for battery-operated systems. Deploying CellMute™ technology to filter the wireless EMI noise from cellular phones and wireless networks, the SK7102 can work quietly in wireless environment. The SK7102 partially implements the Lenovo TrackPoint® extended command protocol and can work with Lenovo TrackPoint® device drivers directly. A set of software tools were developed to support SK7102 design. Click here to download these tools.